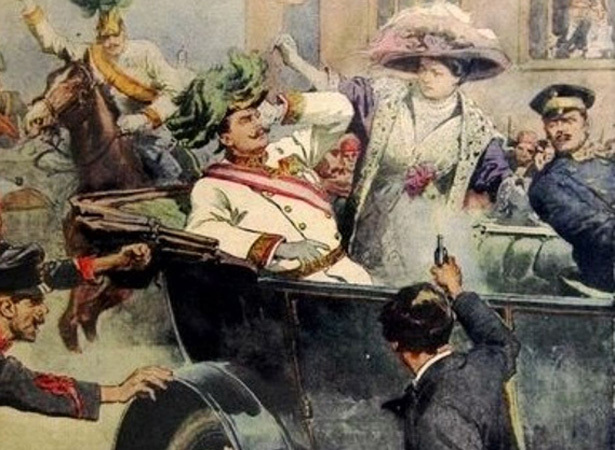 The assassination of Archduke Franz Ferdinand, heir to the Austro-Hungarian throne, and his wife Sophie in Sarajevo (the capital of the Austro-Hungarian province of Bosnia-Herzegovina) on 28 June 1914 eventually led to the outbreak of the First World War. News of the killings appeared in the New Zealand press on 30 June, with headlines labelling the event the ‘Tragedy in Sarajevo’ and describing the assassinations as ‘Murder’. The Evening Post called the killings a politically motivated crime. The Auckland Star claimed that a ‘disregarded warning’ had placed the Archduke and his wife in danger – ‘It is reported that, in view of the Pan-Servian agitation in Bosnia, efforts were made to persuade the Archduke to relinquish his visit’. The New Zealand Herald of 3 July ran a story focusing on the personal tragedy of the ‘Three orphan children’, who ‘broke into convulsive weeping’ when told their parents had died. Those responsible were described as ‘callous’. The assassin – Gavrilo Princip – was a member of a Bosnian Serb nationalist group seeking to unite territories containing ethnic Serbs under Serbia’s control. Convinced that the Serbian government had assisted Princip's group, Austria-Hungary issued a series of harsh demands, most of which the Serbs accepted. Austria-Hungary nevertheless declared war on Serbia on 28 July, setting off a chain reaction of military mobilisations prompted by Europe's system of alliances. Russia and France were soon at war with Germany and Austria-Hungary (the Central Powers). When German forces invaded Belgium, Britain declared war on Germany on 4 August 1914. The First World War had begun. We have 19 biographies, 40 articles, related to Assassination of Archduke Franz Ferdinand.